This essay is intended for OER practitioners and advocates, particularly in the United States (or some few other countries) where the financial impact of textbook cost is one of the main drivers — at least when talking to policy-makers who are not directly in the high ed world — of the discussions around OER. Personally, I find the strengths of OER with respect to academic freedom and open pedagogy to be equally compelling as the economic realities. But it is hard to ignore the obvious fact that, in the US at least, the economic damage being done to today's students is so horrific that a spectacular advantage to OER is their cost. This essay tries to quantify one aspect of that economic issue. 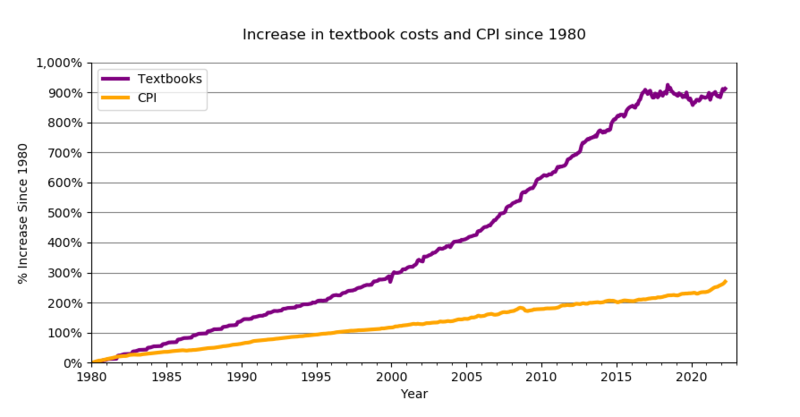 I've used [versions of] the following graph many times when talking about the cost of textbooks, as part of building a case for OER. But I actually think this graph is basically backwards [and upside-down, inside-out, and otherwise non-optimal]. There is no denying that it does have a certain visceral impact. It reaches out and smacks the viewer in the visual cortex with the fact that textbook prices have been increasing much faster than the aggregate cost of other typical consumer goods and services. [The CPI, standing for Consumer Price Index, measures the changing cost of a fundamental basket of goods and services -- it's just another term for inflation]. The intuitions about textbook prices of today's decision-makers, who themselves probably went to school some time ago, are wildly incorrect. Let me explain why I think we more senior people in positions with some authority to make decisions about textbooks have a skewed intuition on this topic. I tend to think that many people basically assume that things in their environment remain constant. This is why you are shocked when you go back to your old elementary school, years later, and see how small everything is. Or when you go back to your old college campus and see how many more students there are, or how there are now different, new buildings, or how that building which seemed so spanking new, before, now seems so old and shabby. But, as adults, we gradually learn that things do change, albeit slowly. One of the things we learn along these lines is how prices always go up, because of inflation. [Well, obviously not everywhere and always, but for a number of years in recent times across a good part of the globe — and certainly for the last generation in the US.] Sophisticated adults [or maybe just adults who are awake] realize that everything in the past seemed cheaper because money was worth more back then, so you need more units of currency to buy the same thing today than you did last year. Sure, the number of units of currency I need to exchange for those books is larger than it was when I was a student, but that's true of every commodity and service. I remember it was painful paying for textbooks back in the day, but we were tough and figured it out. Probably the higher price tag on textbooks today is just due to inflation, and this generation of students is a bunch of whiners. No, the difference isn't just inflation. No, today's students aren't just whiners. But I think that graph could be improved, actually to show some measure of the gap between the price of textbooks and what our — inflation-adjusted — intuition says they should cost. The measure should be based on comparing what textbooks cost when a particular person is looking backwards from today to the cost they remember from when they were a student. More specifically, I think we should make a graph which goes back from the present to show what books would have had to cost, in some past year when a particular decision-maker was a student, if those books' price today were as it actually is, but if (contrary to fact) they had been inflating along with the ambient CPI (and not the actual insane inflation rate for books) in the time from those past student days to now. I remember that textbooks were expensive when I was a student in 1985. I have a vague recollection that \$100 would have been a lot to pay for a book (or the books) used in one course, but that I did pay that amount for some courses (in 1985). That expense of \$100 in 1985, if it had been rising at the same rate as over-all inflation, would have corresponded to a \$228 cost for textbooks in one course, today. 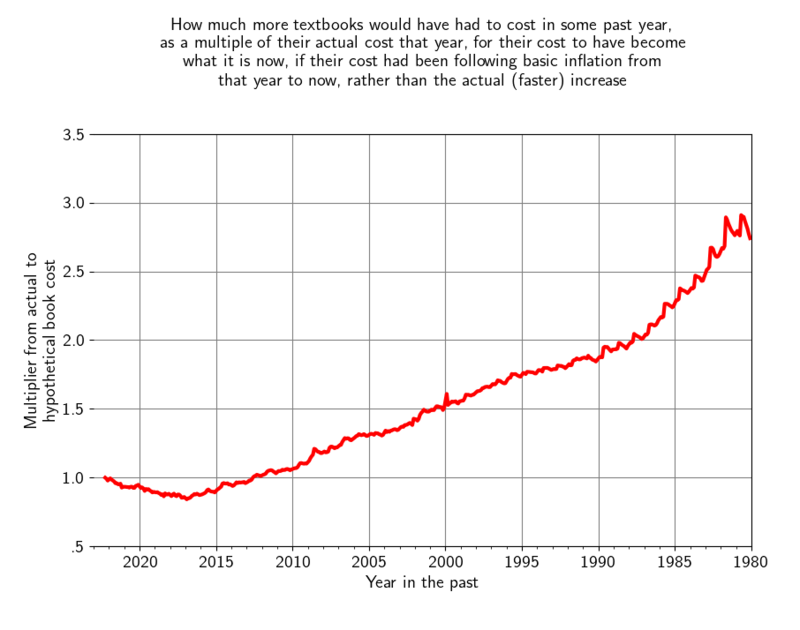 In fact, textbook costs have actually been rising much faster than inflation, so the amount corresponding to a \$100 textbook cost for one course in 1985 is \$583 today. On the other hand, if those books in 1985 had cost \$256 and their price was rising at the same rate as over-all inflation, then they would now cost that \$583. In other words, to adjust my intuition from my time in school in 1985 and how much inflation changed prices up to now to an intuition for how much actual textbook costs have increased from 1985 to now, I would have to take my recollection of costs in 1985 and multiply them all by 2.56. To say it yet another way, for me to have had as much a difficulty about textbook costs back in 1985 as students have today, my costs in 1985 would have had to be more than two and a half times larger than they actually were. If you went to school in some year other than 1985, just use the red curve in the above graph to find out what the adjustment factor was for your actual year (in the way that 2.56 is the factor for my year of 1985). One problem with this graph is that it's almost certainly too complicated to explain to a general audience. But for experts in the OER space, it seems to explain something fairly specific: the gap between today's decision-makers intuition based on inflation for how much things have changed since they were students and the reality of the actual, crazy amount textbook prices have increased. Perhaps this perspective could be more easily — but less precisely — explained as being a graph of the textbook pain multiplier. That is, a viewer can look on the x-axis for the year that they were a student. Then [the y value of] the corresponding point on the curve tells how much that viewer must multiply their memory of how difficult [painful] it was for them to buy textbooks when they were a student to get the difficulty [pain] of today's students. Two cautions about what I'm trying to do here. Notice that this graph will have to be re-drawn every future year to be valid in that year. It is telling us the textbook pain multiplier for a decision-maker thinking back to the year they were in school to understand the textbook pain experienced by this year's students [more precisely, it is telling how much we would have to multiply the costs students experienced in some hypothetical past year in order for textbooks at that price, if they experienced regular inflation (and not the actual, higher rate of increase of textbook cost) and ended up at this year's textbook costs]. Since this depends upon what is "this year", it will have to be re-drawn every year. 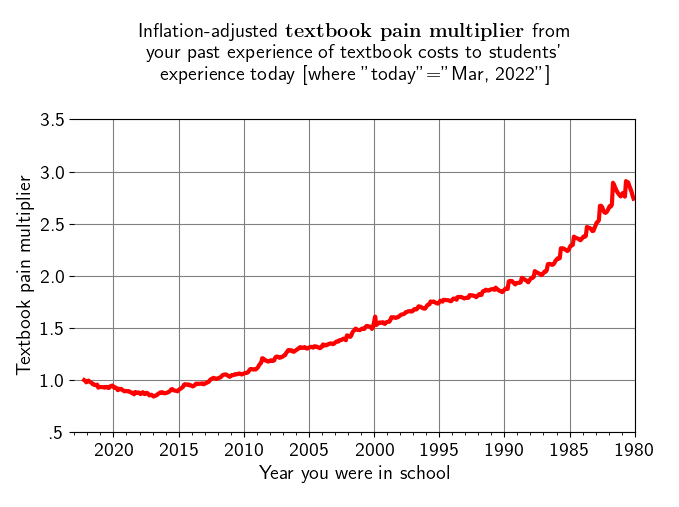 The idea of this new graph of textbook pain multiplier is to depict fairly precisely the inflation-adjusted difference in impact of textbook costs on today's students and what that impact would have been on today's decision-makers back when they were students. But if you are an economist you might comment that the CPI itself is not really reliable over long periods of time (decades), since the basket of goods and services everyone thinks everyone needs changes over time. Back in the early 1980s, when I was a student, there were no smartphones, for example, so buying a phone and paying the service provider was not in the standard basket of goods and services at that point. That means that the part of the above analysis which is inflation-adjusted could be called into question. Actually, I'm not particularly worried about that effect, since I think those who build and collect data on the CPI have probably done a very reasonable job of figuring out how to compensate for the changing notion of what should be in the standard basket. A much larger effect, for which compensation is much less obvious, is the changing economics of higher education in the United States over the last few decades. I don't mean the increasing cost of textbooks, but rather the whole funding model. For example, in a very real sense the US doesn't have public higher education any more, since by far the largest part of the budget for so-called public institutions of higher ed here comes from student tuition, not from public funds. That seems to tell me that textbook pain is a part of a whole constellation of economic blows against current students, which make a myopic concentration on the cost of textbooks a bit of an over-simplification. However, I still think the discussion above has some value, because I think it is an underestimate of the actual textbook pain multiplier. The reasoning here is a bit like that for a graduated income tax: the impact of an x% tax rate on the lifestyle of someone whose annual salary is \$100k is very different — much greater — from the impact on another person whose salary is \$1million. In the same way, if a student today is paying much more in tuition, incurring much greater (inescapable) debt, and generally has a much weaker social safety net on which they and their family can rely for other basic needs, then a 2.56-fold increase in the cost of textbooks, even though textbooks are only a part of their total educational expenses, will have a far greater impact on their lives than it would have had for a student in 1985 when all of those public goods were funded by the public. In the long run, some smart social scientist might figure out how to adjust for the lower public funding of education, the vanishing social safety net, and etc., etc., in the way I have adjusted the above textbook pain multiplier for inflation. I will be eager to see that analysis! But in the meantime, we in the OER world can use the above graph of inflation-adjusted textbook pain multiplier in our attempts at convincing decision-makers to get on board, knowing that the graph shows an underestimate of the true pain inflicted by the rising cost of textbooks. In the spirit of scholarly openness, I want to explain where I got the data for the graphs above, how I made the graphs, and why they show what I say they show. Probably this part is only of interest to those who know the sublime joy of data, and to someone who might want to update one of the above graphs in a future year, or extend the time axis of the graphs farther into the past, or make some other such extension. The data comes (of course) from the Bureau of Labor Statistics [BLS] in the US Department of Labor. These are great people, who are very careful and thorough and also amazingly responsive and helpful when you contact them by phone or through their website! Basic CPI information is in the series the BLS calls CUUR0000SA0, which can be found at https://data.bls.gov/timeseries/CUUR0000SA0. At that site, one can make various selections, such as for the range of years whose data will be retrieved, etc. I made the choice to get data from 1980 to 2018 including annual averages, resulting in the file SeriesReport-20181111220434_7f71ab.xlsx that I then exported to a CSV file SeriesReport-20181111220434_7f71ab.csv. Textbook price information is in the BLS's series CUUR0000SEEA, at https://data.bls.gov/timeseries/CUUR0000SEEA. Data from 1980 to 2018 including annual averages is in the file SeriesReport-20181111220157_d5f9c2.xlsx or, more conveniently, in SeriesReport-20181111220157_d5f9c2.csv. I then started Python (version 3.5.2; on my Linux box running Linux Mint 18.3 Sylvia; using also Matplotlib 1.5.1), ran the script make_graphs.py, and saved the three graphs it made. Those graphs (trimmed a little with the GIMP, actually) are what appears above. How does this does this script calculate the inflation-adjusted textbook pain multiple and why does it do so correctly? c[i] is the CPI in year i of the dataset. Note that both b and c have been normalized by the BLS so that a particular year (or, in fact, the average of the years 1982-84) corresponds to the value 100 for that variable. But since we are using ratios of values of these variables for different years all such (multiplicative) normalizations come out in the wash.
You may well ask why that is the correct expression for m[i]. Let's see, we're looking, in year i, for a multiple of the book price in that year — so, a value of the form m[i]*b[i] — with the property that if normal, CPI-based inflation acted on it up through year r, the resulting value would equal b[r]. But to take any price p in year i and act on it by inflation from that year i to the most recent year r, you just multiply p by c[r]/c[i]. which is exactly what is in the script. Creative Commons Attribution-ShareAlike 4.0 license, unless otherwise specified.